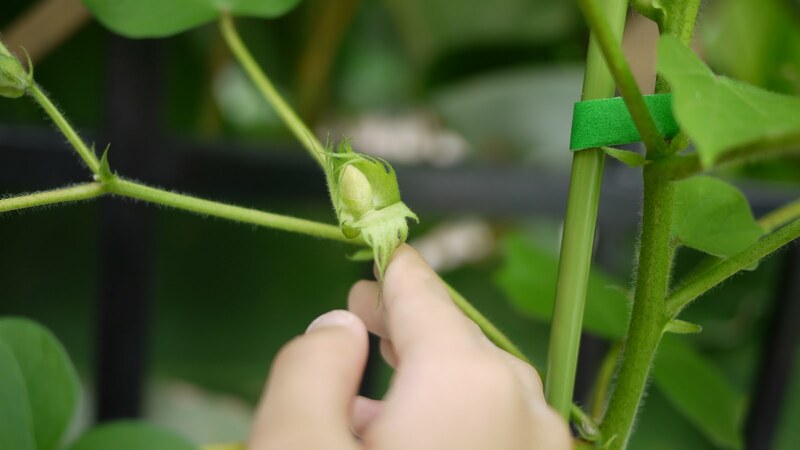 It’s been a long time since I blogged about my cotton plant. It is still doing well but is now a little tired. 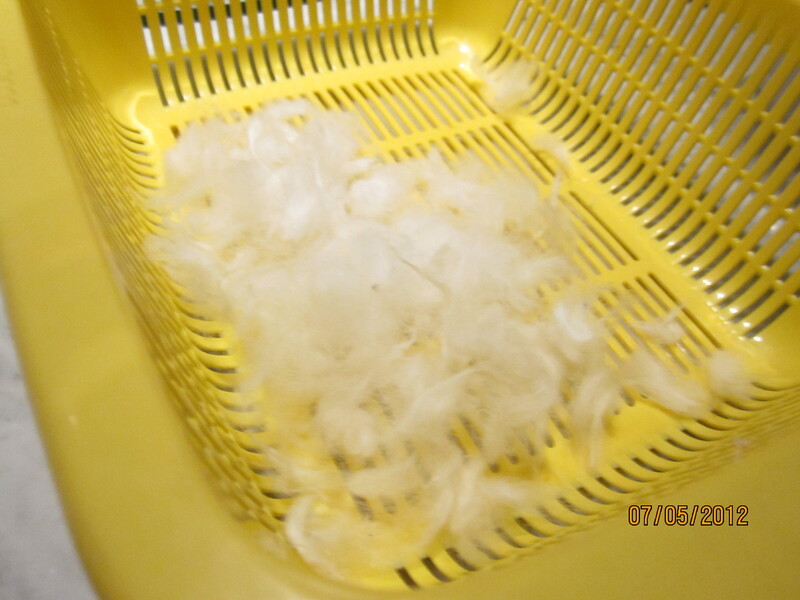 I have almost enough cotton for a small pillow! 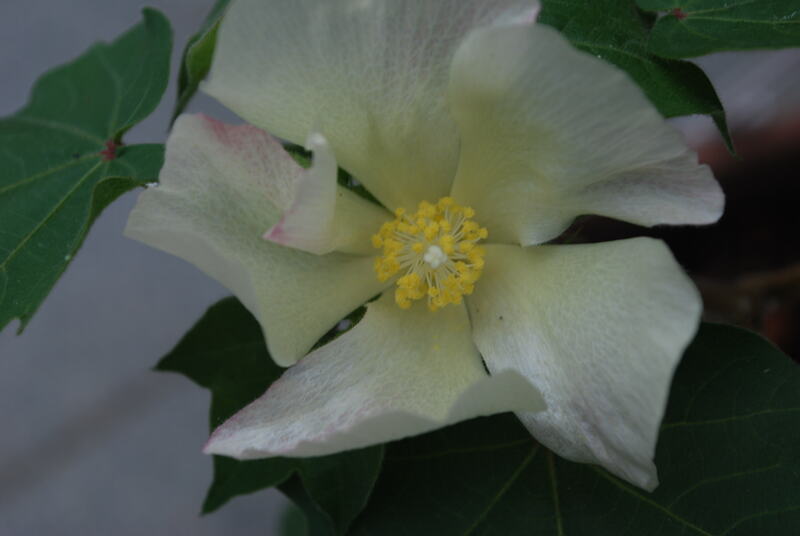 Here is a pretty cotton flower. 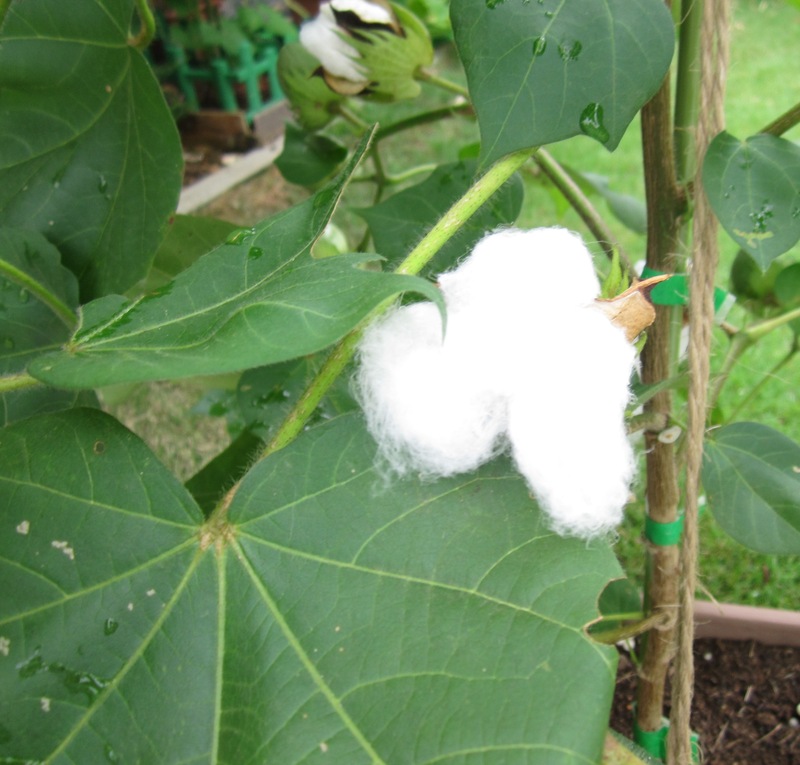 My cotton plant from Novice Gardener has cottoned on to the fact that we are more pleased with it when it produces more bolls. So it has been very busy flowering, candling and bolling away! Novice Gardener has been having mealy issues. 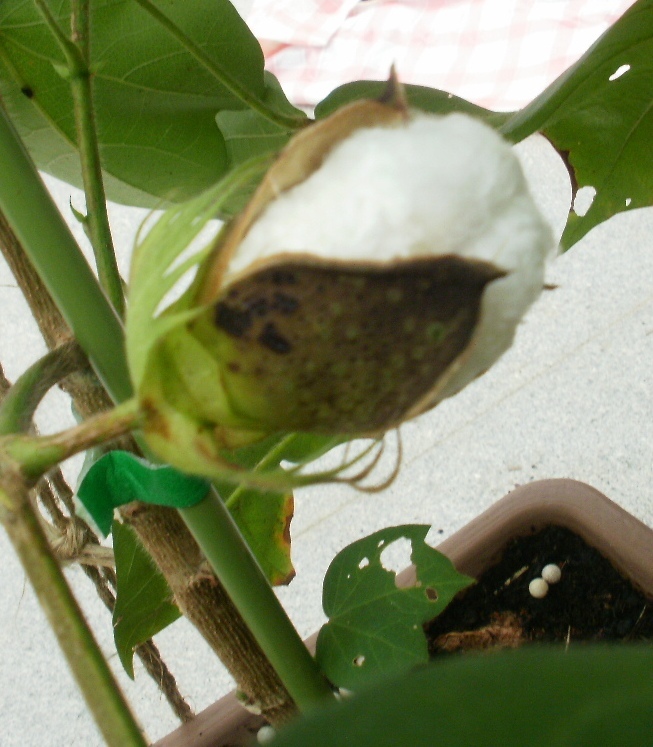 Our cotton plants followed their bad example. And then our frangipani followed along too. 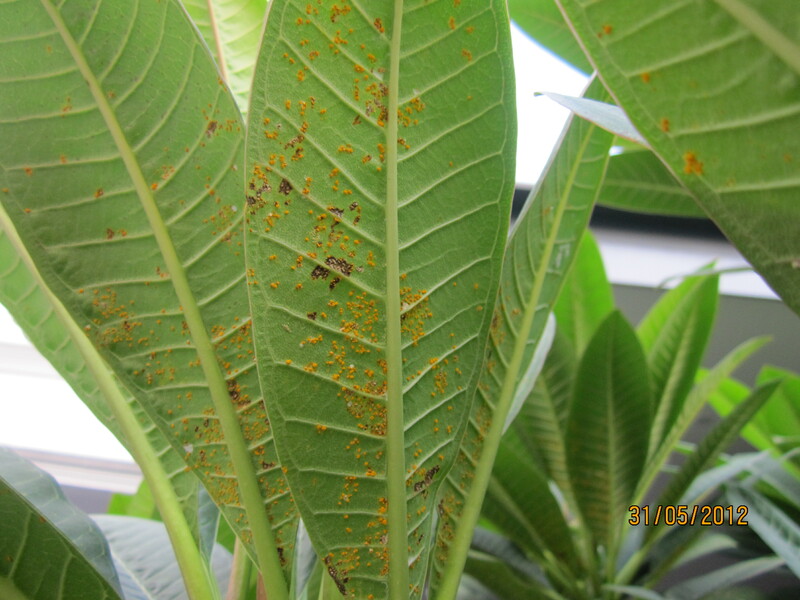 And even more horrible, look at the red rust on this leaf below! It must be time for the Paid Gardener to attack the rust with chemical zappers! 1. I admired the mulberry bush in the front garden which had a real, black mulberry on it. Imagine, that is the bush she keeps for the BIRDS! There is a human bush at the back. I don’t have a photo of the mulberry because I ate it with Mummy. 2. 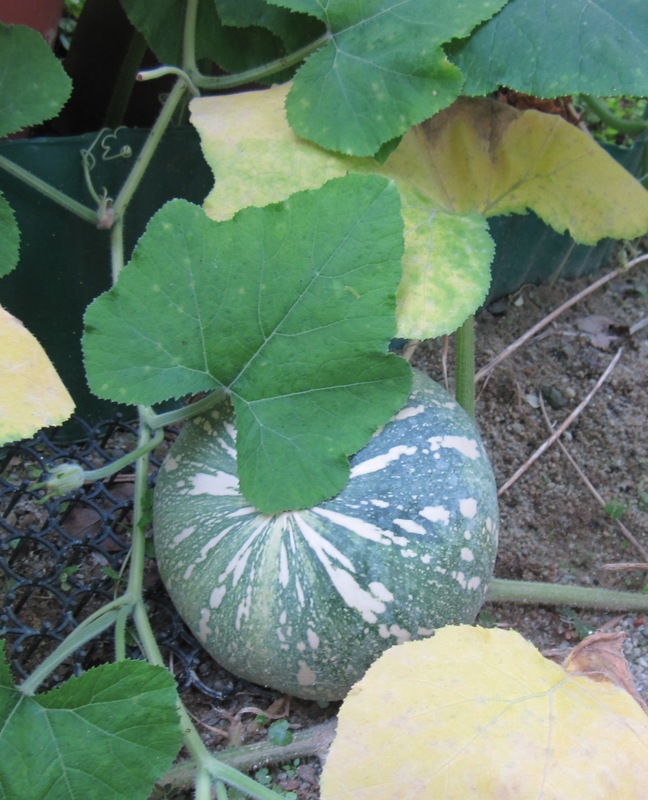 I admired her pumpkin vines which were all growing in 2 straight lines. Just like my class when we have to move from place to place. 4. Then I noticed Mummy was twitching and green so I looked at other plants like the peanuts. I forgot macro so the photo isn’t very nice, so I won’t post it. I also looked at her purple round eggplant that she kindly offered to let me harvest and bring home (Mummy said not to be greedy, so I didn’t), and then her mimi kangkong. It was a bit odd because she grew mimi on one side of the pot and not-mimi on the other. 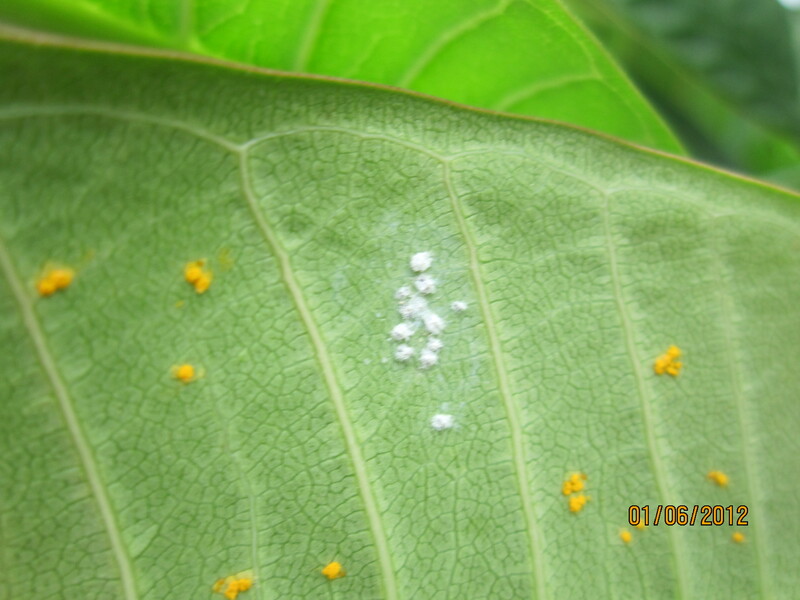 Her cotton plants have been attacked by mealy bugs. I wonder why? 5. 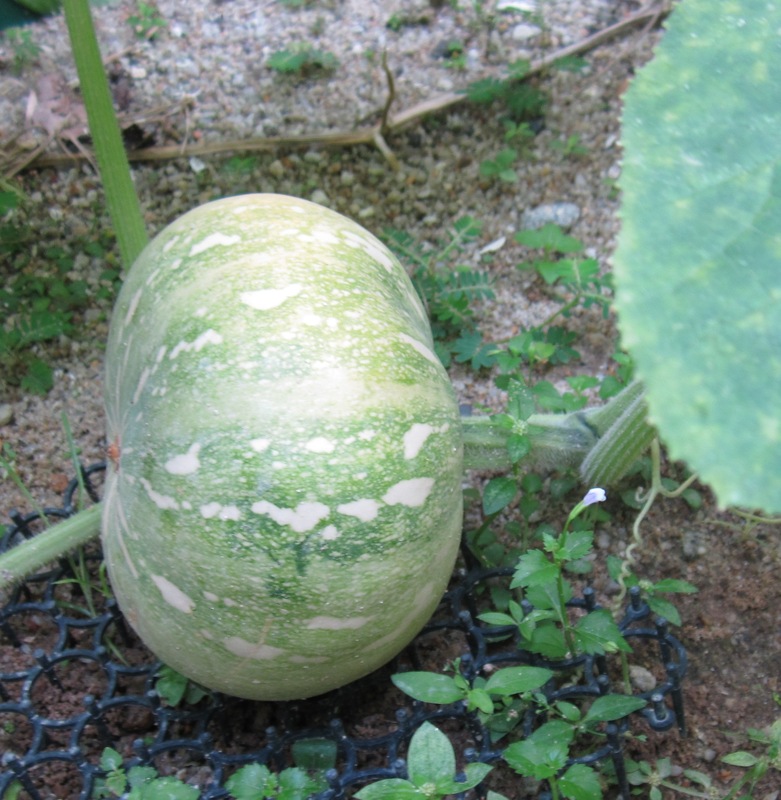 I also admired her beautiful new wintermelon which has a proper wintermelon shape. Novice Gardener said it looked like her figure, so Mummy asked why ours did not look like Mummy’s figure but instead looks like The Big Sister and I. We look like lollipops. 6. 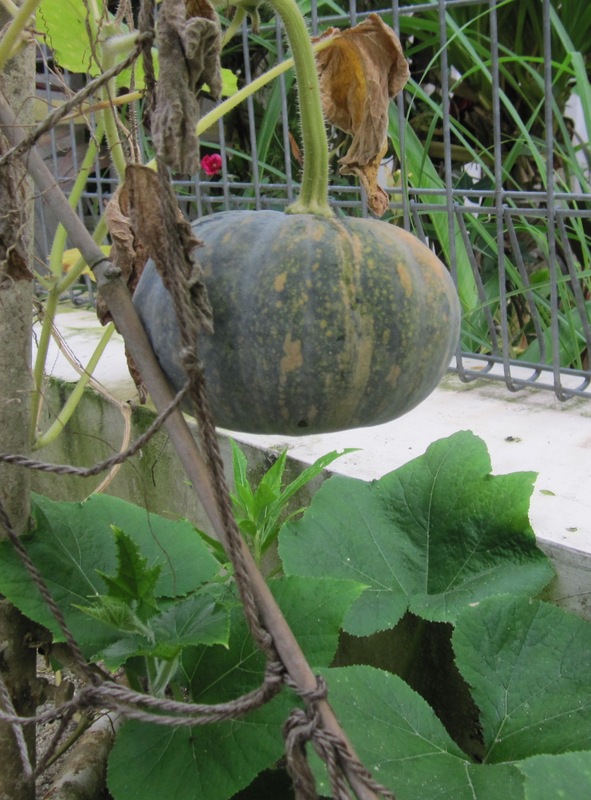 Then as a special treat, I got to harvest the biggest local pumpkin! And Novice Gardener gave me some red okra seeds and a bunch of bananas for Mummy to make banana chiffon with! And a massive bunch of Thai basil which smelled very good in the car. The only sad things about the visit were that Novice Gardener’s nephew was sleeping and couldn’t play (she tried to wake him but he was grouchy) and I got bitten by mosquitoes on my forehead and nose. Otherwise it was a Wonderful Time! Thank you, Novice Gardener! Novice Gardener will be jealous. 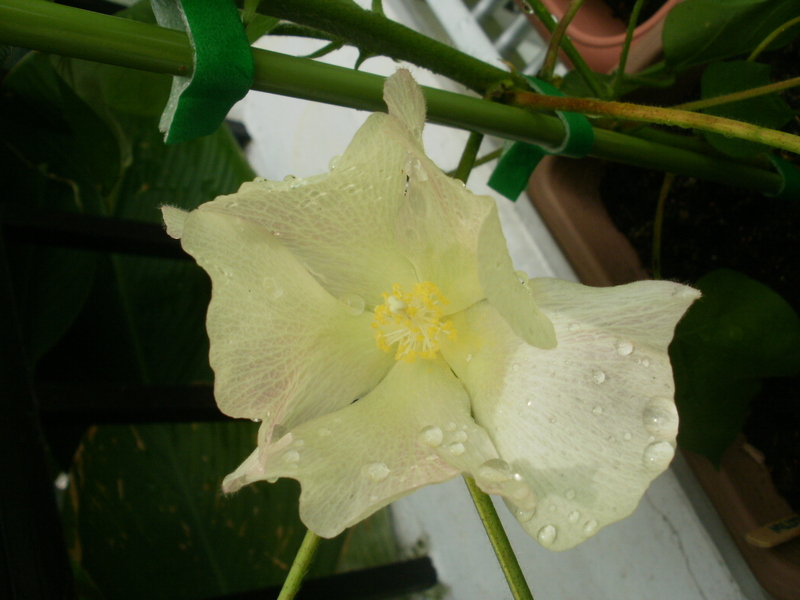 Novice Gardener gave me a tiny cotton plant and we fed it and sunned it and watered it and now it is blooming. I am holding down one side of the pretty cotton square below so you can see the candle inside. 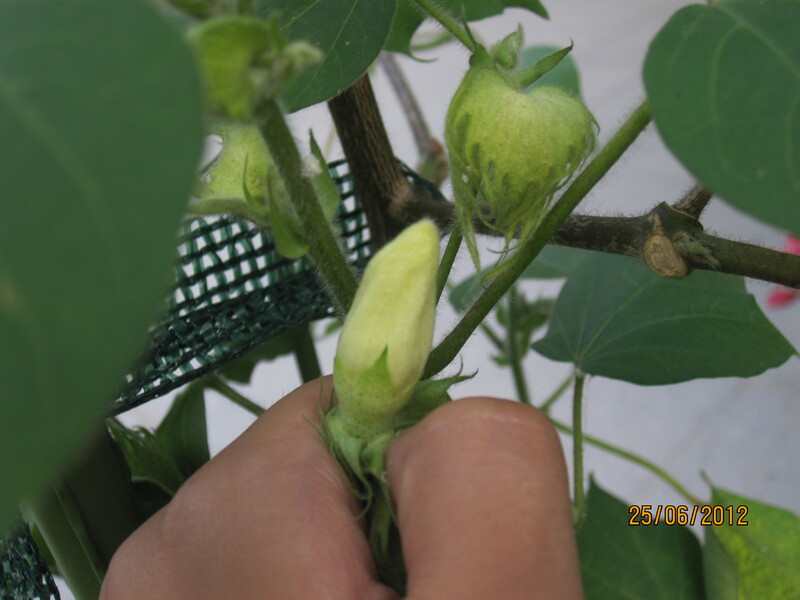 The parts of the cotton flower are really called the square (that’s the leafy outside) and the candle (the white bud inside). Phoodietravelogue took this photo 5 days ago. 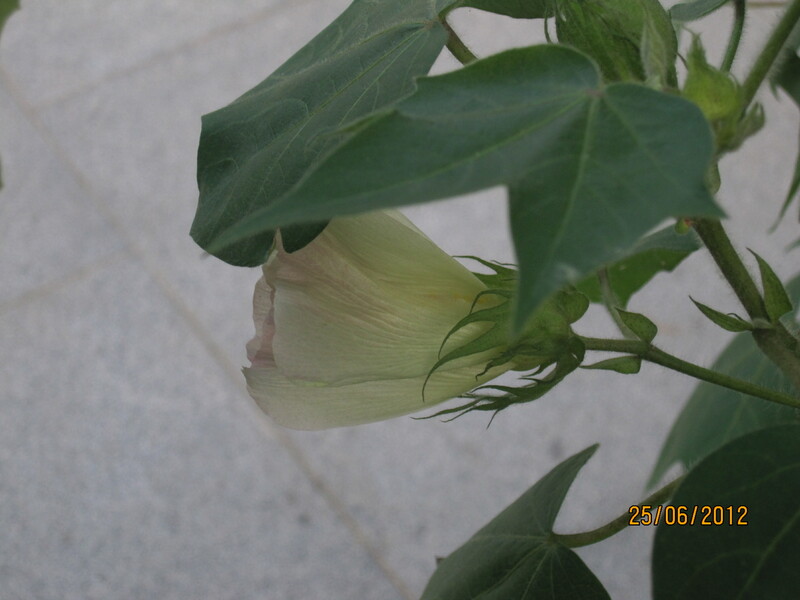 Yesterday morning a pretty white flower appeared! By the afternoon, it had turned pink. See how pretty it is? By today it will be dark pink and then it will fall off. 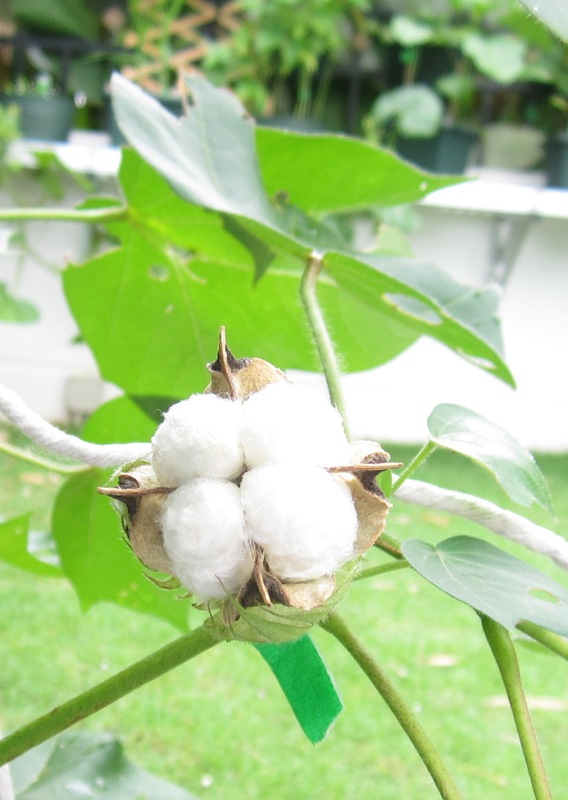 I am waiting to get my own cotton bolls! PS I studied about cotton flowers on this website.